Mardi Himal trekking is one of the bitten Eco-tourism based trekking destination in Annapurna Himalaya region. Mardi Himal trekking offer beautiful Himalayan views of whole Annapurna Himalayan range , beautiful valley, mixed Nepalese culture follow through Annapurna trekking trails. We Himalaya Journey Trekking arrange both options Mardi Himal trip : just Mardi Himal base camp trekking or Mardi Himal climbing trip . Mardi Himal is the name given to the feature of the long rising ridge and its summit that from the south-westerly lower slope of Mount Machhapuchhare, the famous triangular skyline that is seen from the Phewa Lake at Pokhara. 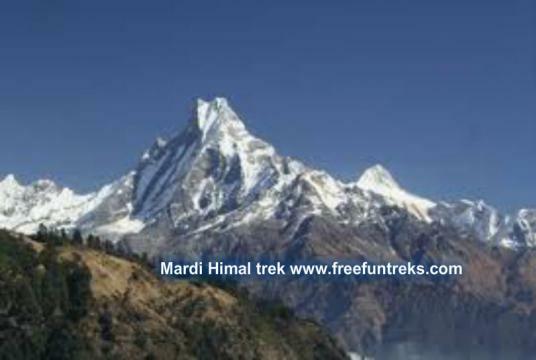 Mardi Himal is located in the east of the Modi Khola, across the valley from Hiunchuli. It is separated from Machhapuchhre ridge by a col. and usual route of ascent reaches this col (about 5,200m. /17,060 ft.) and reaches the summit via a route on its east flank. The climb begins by heading steeply towards the col on the connecting ridge between Mardi Himal and Machhapuchhre. The first ascent to the Mardi Himal in 1961. The first route was via the East Flank and it is the only used so far. Only camping / tented trekking is possible in relevant areas. Day 01: Arrival in kathmandu 1334m, transfer to hotel , Mardi Himal trekking briefing with officially arrangements. overnight at kathmandu hotel. .
Day 02: Katmandu by bus or flight to pokhara 915m.overnight at pokhara. Day 05: Kokar to Low camp. Day 12: After breakfast, our tour guide will take to for historical monuments sightseeing in kathmandu valley such as Boudhhanath: visit Bodhnath Stupa, one of the biggest Buddhist shrines in the world, where we observe Buddhist monks in prayer in the monasteries surrounding the stupa than visit Pashupatinath: the most famous Hindu temple in the country, located on the banks of the holy Bagmati River. Here you see Hindu holy men (sadhus) meditating, pilgrims bathing and occasionally funeral pyres burning on the ghats. Kathmandu durbar square: you will enjoy with different Hindus Temple , Goddes Kumari, legend of kathmadu valley and in the evening farewell dinner in Nepalese Restaurant, overnight at kathmandu in Hotel. Day 13: After breakfast, Relaxing/shopping with own activities than drop to Kathmandu international airport for onward journey.